from the 1930 Local Elections a poster for John Lumsden of The Irish Worker League who was running in Area Number 5. He polled a respectable 611 votes but failed to win a seat. Party Colleague Jim Larkin was elected in Area no 2. Should anyone have any more information on that 1930 Election, John Lumsden or the Irish Worker League , I would (and the sender) be very grateful. It is an interesting enough read telling what would come to pass were we to join the then ‘Common Market’ and giving an Alternative Irish Economy. The EU of today which has no restriction on the flow of capital, goods or labour between member countries’ has come to pass. 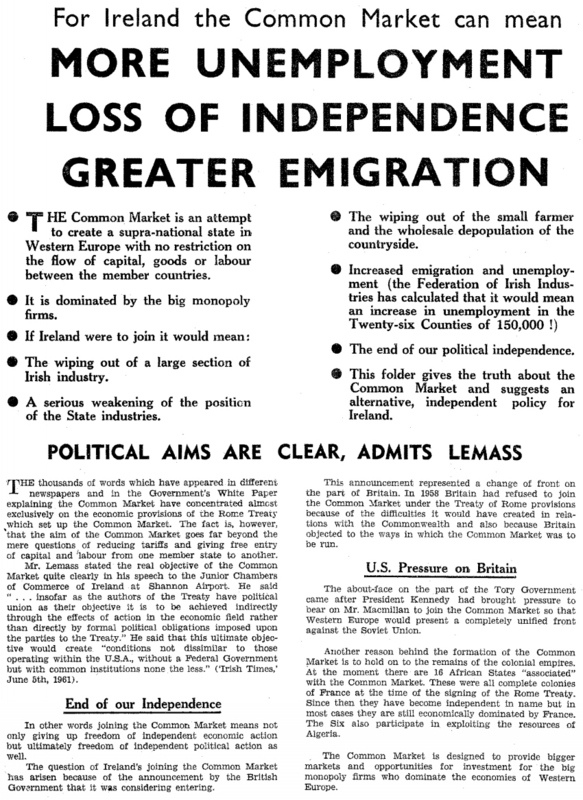 The effect of Ireland joining as spelt out also came true in areas such as ‘A serious weakening of the position of State industries’, ‘The wiping out of a large section of Irish Industry’ and emigration flourished for 25 years after our initial membership.